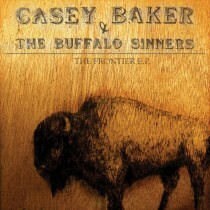 Casey Baker is the promising Ontario-based singer/ songwriter who’s music follows one simple rule; brutal truth! His fresh blend of folk rock, and country sets a calm musical harness for lyrics that have proven to silence crowds by the hundreds. “I’m not afraid to reveal who I am in these songs” says Baker in recent interview with Radio Laurier. “These songs are about absolute honesty, and admitting what you desire even if it makes you look like the bad guy”. Influenced by Canadian legends Neil Young, Leonard Cohen, and Hayden, as well as country icon Johnny Cash, Casey has effectively fused story telling and heavy emotion with songs that discuss everything from one night stands to hitch-hiker murder mysteries. His independently released debut solo EP complete with hand-made “one of a kind” packaging has sold more than 1000 copies in just 3 months. Recent months have proven to be a new beginning for Casey Baker as his music is gaining momentum and a faithful fanbase with each day that goes by. His association with City & Colour has established a national awareness that Baker says he will stop at nothing to persue. He lets the songs speak for themselves and wins listeners over one ear at a time.